Introduction .. Ten days ago I sent a few ideas to the Police Tweet Awards Team. In the email, I suggested how, with the 2016 Finalists now published, there maybe a ton of story telling opportunities. On 7 Oct 16, I was delighted this tweet was made, 'Thank you @mikedownesz - Mike is helping @policeawards promote the awards finalists- looking forward to showcasing your work #poltawards'. I added this tweet, 'polite notice, I'm doing this as a neutral storytelling educator for the #poltawards event, so I'm def not a judge and all posts are without bias'. I will add a further disclaimer - all ideas on this page are from me (mike downes) and are presented as a work in progress - a beta. This collection, on this blog, is in a public place designed for comments and collaboration. I will do my best as an educator to answer three important questions about the Police Tweet Awards Finalists 2016..
As I watched the 27 Sep 16 periscope broadcast hosted by Kerry Blakeman and frantically noted down those sixteen category finalists, the main thought I had was, Who are these people - I've not heard of most of them? For someone who's been following UK Social Policing for the last five years, I was a little disappointed with myself. Then I realised there are thousands of police twitter accounts, it's impossible to keep track of them all. For this example, let' say there are 5,000 - the Police Tweet Finalists represent just 1%. Image a 50 seater coach full of those finalists and then another 99 coaches full of those people who voted. The procession line would be one mile long - for a real life example, imagine the finalists Coach parked at Buckingham Palace where Coach 100 would be at Somerset House (see the map). For most of us twitter is a fast messaging service - and it's in our pocket. Where behind that are real people, and in this case doing a vital job for Public Safety and Community Support. Getting back to the imagined procession, let's say there was a real life finalists event in Buckingham Palace (why not let's think big) where on entering the Ballroom you meet those finalists. That is what this page is all about - providing each and everyone of us with some knowledge. 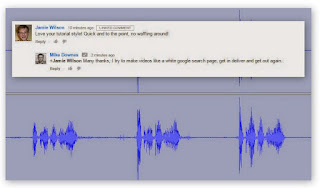 The Timeline .. From what I know, the Police Tweet Awards 2015 winners were announced 22 Dec 2015 (you can watch Kerry Blakeman and guests here at youtube, 45 mins). Where the @policeawards twitter account was created on 23 Dec 15. Then a quiet period before voting opened on 1 July 2016 for the Police Tweet Awards 2016 (with video announcement 27 Jul 16). Voting closed 31 Aug 16, where finalists were announced on 27 Sep16 (periscope video). Winners will be announced at a ceremony on 23 Dec 16. What follows on this page, is the start of a collection of resources, ideas and learning opportunities. And everyone means everyone: judges, finalists, the public and mainstream media should (they need it). 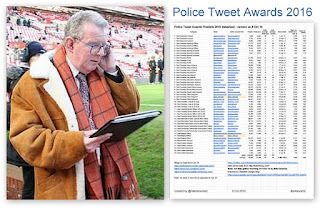 The Police Tweet Awards Finalists twitter list - best to use this list in two ways, realtime tweets and a list on nominees. You may expect about 733 tweets arriving a day. An Interactive Clickable Google Map - Using this map you will get a slightly different experience on desktop than mobile. You can search, click and drag but most of all start to visualise the finalists. Make sure you look North to Lochaber and Sky and South to Gibraltar. For those who wish to learn about Maps, I'll make a video outlining how it's done and how a kmx file is exported then imported to Google Earth as a layer, then allowing HD movies to be made. The Police Tweet Awards 2016 data sheet (version 8 Oct16) - at this stage there are no charts, this is intentional (see below). There are ten columns where some are self explanatory. Anything in blue font you can click on for external links. 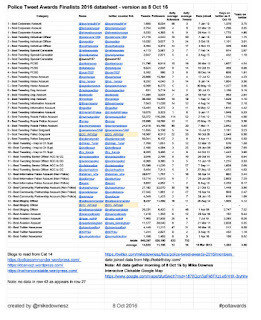 It was not that slow a process to copy twittercounter data onto the sheet (for tweets, followers and daily averages. In the totals row, see how the finalists have made 640,267 tweets (as survey date 8 Oct 16). And how 733 tweets are made every day. In my view, twitter is about real people doing a valuable and important policing job. That is often overlooked when data is gathered and some folks talk about reach, impressions and stuff like that. That's why I have made no charts or graphs - even though Google Sheets has a fantastic new explore feature where google will just make some charts based on a spoken voice question. Bear with me, all the charts will come. 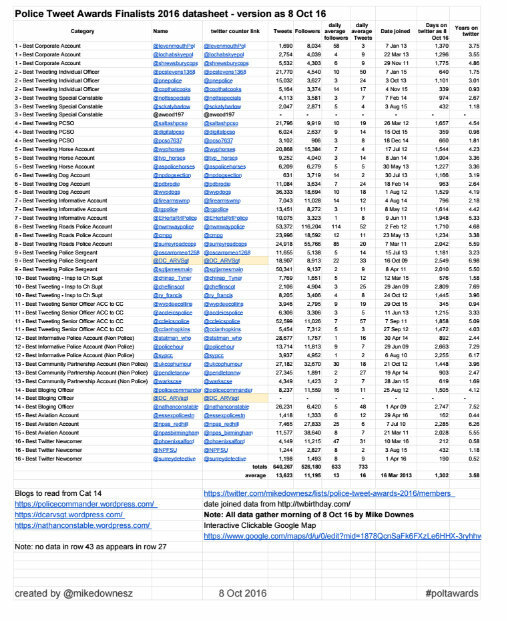 For anyone reading this, I can send a link to a public copy of the google slides data sheet. Another quite beautiful thing, I export the sheet into Google Earth Maps and just like that all this data will be geolocated based and clickable -- see how these tools all seamlessly interweave. Body of Work .. In the next seventy five days until the final on 23 Dec 16, I would like to create many more resources based on certain ideas, but of course be real in terms of how I work alone or with others knowing there is a deadline of the 23rd Dec.
As as primary school teacher, it's natural for me to create lessons that are fun. The children always respond well to games and activities that are fun and engaging. For me as the educator it's a way to exploit knowledge (simple example counts in 2s, then down from twenty and count, miss one, count -- and as if by magic it's the x4 times table). The same can be done with the Police Tweet Awards. What I would add, to tell these stories. For example Creative Nonfiction is where you take the facts, look for a story and tell it well, where if you are really lucky some magic and art will happen in the process (I have some notes on that idea). For me as 'mike downes' who has been following Social Policing for over five years, the Police Tweet Awards 216 is one chapter in a much larger story. Whatever happens in the next seventy five days (9 Oct to 23 Dec 16) will set us all up as a stepping stone and a building block for 2017 and beyond. To learn more about mike downes, visit the About page.